New Project! The Tabletop Deathmatch. 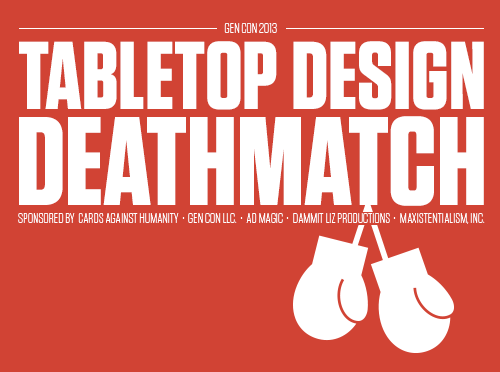 Dammit Liz Productions is proud to produce the TableTop Deathmatch at Gen Con Indy 2013! “Cards Against Humanity will host a one-of-a-kind independent tabletop game design challenge at Gen Con Indy 2013. Unpublished independent game creators will present prototypes to a panel of industry-leading designers including Mike Selinker (Lone Shark Games, Wizards of the Coast, Avalon Hill) Luke Crane (The Burning Wheel, games project specialist at Kickstarter), Shari Spiro (Founder, Ad Magic), and the creators of Cards Against Humanity. The most promising game presented will win $7,500 towards the production costs of a first print run with Ad Magic and a table on the floor at Gen Con Indy 2014. Prizes are furnished by Cards Against Humanity, Ad Magic, Gen Con LLC., and Maxistentialism Inc. The Deathmatch design contest is produced by Dammit Liz Productions. Applicants can learn more and submit their game at CardsAgainstHumanity.com/deathmatch. Cards Against Humanity is an independent card game that was initially funded on Kickstarter. It’s now the top selling, best rated, and most wished for item on Amazon.com. The entire game is also available as a free download at CardsAgainstHumanity.com. Next Next post: Kirby Krackle CD Release Show!